Contact – To establish contact with the live conductor. Available as mushroom, pointer or ‘Y’ contact to suit the application. Extension – Manufactured and tested to suit the application voltage and provide calibrated capacitance to operate the detector. Four types of extension are available, to suit the specific application voltage range. These may be attached in line to the main body or at an angle using an adaptor. preferential to stand directly below the point of contact with the extension at right angles to the main body, allowing a clear view of the application to the conductor/busbar. 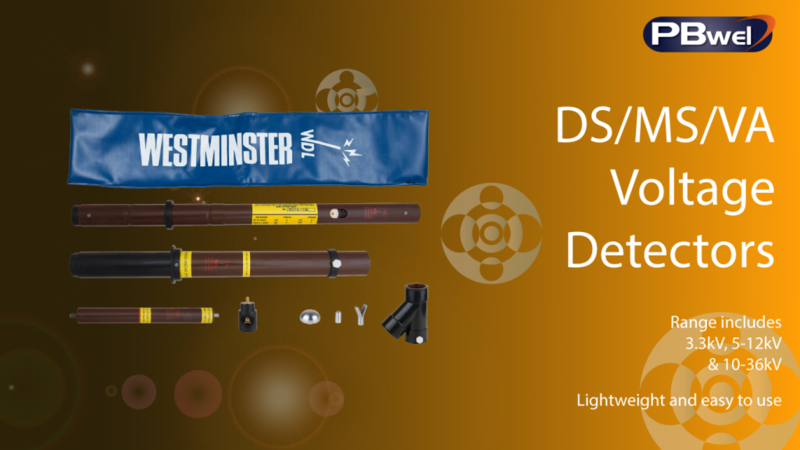 Alternatively, a 60o adaptor is also available for applications where it is preferential to hold the detector at an inclined angle perpendicular to the conductor/busbar, to improve visibility of the Westminster DS/MS/VA detector. For applications where a direct (in-line) application is preferred e.g. inside a cabinet with restricted access, the extension can be directly screwed into the main body omitting the adaptor. Main Body – Houses the voltage detector. Handle – Provides suitable insulation from the voltage being tested and also provides storage for the main body when not in use. Two types of handle are available to suit the operating voltage. P&B Weir Electrical is a globally recognised designer, manufacturer and supplier of temporary portable earthing, voltage detectors and Buchholz Relays. With a heritage spanning over eighty years, and world class experience in equipment designed for the safe maintenance of power systems, P&B Weir Electrical provide customers with high quality service, reliable solutions and technical expertise.